Several things influenced my choices for Misik's challenge to recreate traditions in our work. One was April, which is National Poetry Month. When I taught school, we always did a project combining visual art with poetry, which compliment each other in a beautiful way. Another was my place of birth, Japan, which has long revered the poetic form of haiku, very often inspired by the seasons and the natural world. I chose to celebrate these tiny poppies, which come back year after year in the early spring. Here in New Mexico the weather changes radically from one day to the next, with freezing winds and unpredictable storms being the norm. There is a patch of sidewalk I pass every day while walking the dogs where the flowers sprout anew every year between the cracks. Every year, I collect a seed pod or two and scatter the seeds in my actual garden, where they never grow. It seems they need adversity to thrive, which heartens me as I face setbacks in my own life. 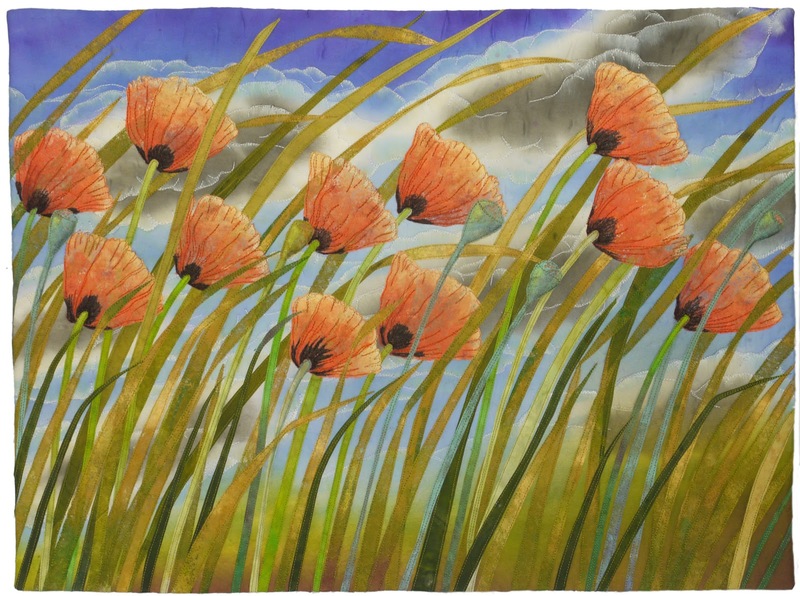 The background is a painting on silk accentuated with paint sticks. 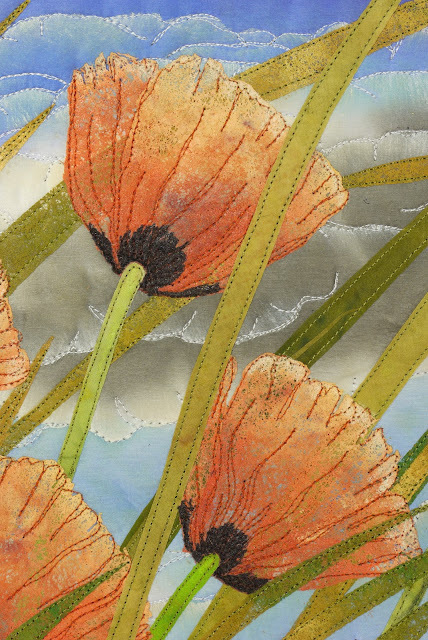 The flowers themselves are made from humble dryer sheets, which, with their used, transparent quality, I felt were a good medium for the delicate, yet amazingly tough little poppies. Lovely quilt, I feel the wind. A lovely quilt with a great backstory! The use of the dryer sheets on the painted silk was brilliant. Great piece.